Thirsty Pilgrim: Monk Closed, Kafka to Re-open, and Get Your Pants Patched. Monk Closed, Kafka to Re-open, and Get Your Pants Patched. A few quick hits on the Brussels café scene for you today. If you're headed there soon with fresh or dog-eared copy of 80 Beers in hand, mix-and-match with this post from April. As usual, all reports welcome. Really helpful folks are sure to get free copies of the hypothetical second edition, vandalized by jokes from my ink pen if that's what turns you on. 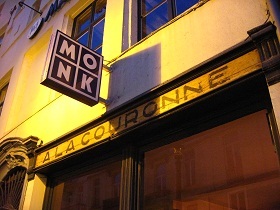 Monk has closed. That would be the hip-yet-old-school wood-paneled café across from the Nordzee fish counter, near the Ste-Catherine cathedral. Handy location and swell place for a De Ranke or Senne beer at friendly prices. Similar to Kafka in April, the place has shut for the owner's financial troubles. Both spots are on the neighborhood's extensive Flemish hideaway circuit. But perhaps there is hope. Some of the local news reports have staff from Monk heading over to help re-open Kafka by late July. With luck the café will still have fresh Zinnebir on draft. A couple of bits from Ixelles: The Belladone indeed remains open, with its interesting beers and vodkas in a high-ceilinged mansion. (There was some doubt after a brief closing last year and stale website.) And on Place Flagey, a new dive called Flip will appeal to poor but thirsty students with holes in their pants. The lovely Dame Cath might be there with her sewing machine to patch them up. Dupont and Ellezeloois beers, at least. Up in Jette, check out the Excelsior Stam Cool café and the 77 bar. And then let me know what you think. Major hip-hop head nod to the great Podge for waking me from a Missouri barbecue-induced stupor by noting the Monk and Kafka news. And one more to the intrepid Simon Croome, who is just a few cafés short of hitting every spot in Brussels 80. 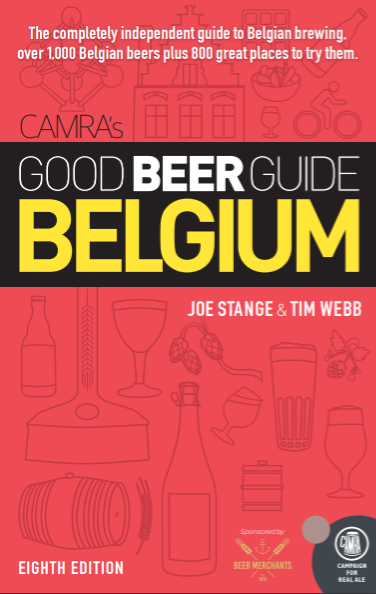 Heading across to Brussels & Bruges late July so thanks for the info. Will have my own dog eared copy of 80 beers in hand which is a couple of years old, any other closures worth noting? Closed: Chapeau d'As, Kafka (to re-open, we think), Monk, Stekerlapatte, Stella Solaris, Ultieme Hallucinatie. No longer beery or notable, a far as we know: Hotel Galia, Imprimerie, Laristo. Surprisingly few closings after three years, IMO, although a couple of those are great losses. Had a beer at the Kafka the day before yesterday. Monk has a warning on its door saying that it will open soon.